At first glance, the picture of the man hugging the beaming young girl appears to show a scene of great happiness. 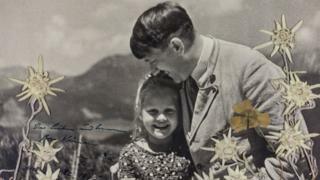 But a closer look reveals a far darker tale: this is Adolf Hitler, the man behind the murder of six million Jews, and the little girl is Jewish. Despite this, Hitler would go on to build a friendship with Rosa Bernile Nienau, which only ended when top Nazi officials intervened five years later. And now this rare, signed image from 1933 is going up for auction in the US. Alexander Historical Auctions, in Maryland, estimates the picture, taken by photographer Heinrich Hoffmann, could fetch as much as $10,000 (£7,500) when it goes on sale on Tuesday. "The signed version is a never-before publicly seen piece," auctioneer Bill Panagopulos told MailOnline. "Hitler was very often photographed with children for propaganda purposes. The shocking thing about this piece is it seems he had a genuine affinity for the young girl. It was a shared birthday which brought a little girl and the Nazi leader together. According to the auction website, Rosa and her mother had joined the crowds outside Hitler's Alpine retreat Berghof in 1933 on his birthday. It is thought that when he discovered Rosa had the same birthday, he invited Rosa and her mother Karoline up to the house - where these photographs were taken. Not long afterwards, it was discovered that Karoline's mother had been Jewish, making Rosa Jewish in the eyes of the Nazi state. But this did not dissuade Hitler from carrying on his friendship with girl, to whom he had sent a signed copy of the photograph. "The dear and [considerate?] Rosa Nienau Adolf Hitler Munich, the 16th June 1933," he wrote. Rosa, it appears, later added her own stamp to the photo, drawing flowers onto the black-and-white image. She would write to Hitler and his aide Wilhelm Bruckner on at least 17 occasions between 1935 and 1938, until she and her mother, a widow, were told to cut off contact by the Nazi leader's private secretary, Martin Bormann. Hitler was unimpressed by the order, Hoffmann would later say. "There are people who have a true talent for spoiling my every joy," Hoffmann recalls the Nazi leader telling him in his book, Hitler Was My Friend. The photographer includes a different picture of the two in his 1955 book, captioned: "Hitler's Sweetheart - it delighted him to see her at the Berghof until some busybody found she was not of pure Aryan descent." The year after Bormann cut off contact, World War Two began. By the time it ended, six years later, six million Jews would be dead. Rosa did not survive the war, either. She died of polio, aged 17, in a hospital in Munich in 1943, a decade after her first meeting with Hitler. The Holocaust: Who are the missing million?